Medical Micro-Needling is a break through remedy for the treatment of wrinkles and pigmentation, scars and stretch marks. To our knowledge, there are no devices with FDA approval- beware of false claims! Needles are used to create 1000s of columns of micro-injury to the skin, stimulating a natural healing response creating new collagen and elastin, remodelling scars, improving skin quality, tone and texture. How Does Medical Needling Work? The treatment introduces fine needles to the skin to create microscopic channels. In doing so the dermis is encouraged to produce new collagen and elastin which generates new skin cells. When the skin is injured a repair process takes place to replace the damaged skin with new collagen and heal the wound. Medical needling leaves the epidermis (the upper most, ‘barrier’ layer of the skin intact, the micro injuries caused by sterile, fine, surgical needles, triggers a complex cascade of wound healing depositing new improved collagen, elastin and hyaluronic acid (the ‘bricks and mortar’ of healthy skin structure) providing firmer and more elastic skin. Clinical studies have shown that micro needling produces channels in the dermis which sufficiently stimulate the body’s natural defenses to repair and produce concentrated amounts of collagen and proteins to the treated areas of skin. This results in the skins thickness being increased by up to 80% smoothing scars, visibly reducing stretch marks and reducing the appearance of wrinkles. There are a variety of devises that may be used. Hand rollers- rows of surgical needles on a small hand roller, which are rolled back and forth over the skin to deliver 100's of controlled columns of micro-injuries. Derma stamps - a small hand tool with a block of needles which may be used to tap the skin repeatedly to apply the needle punctures. Derma pens- a small machine evolved from tattoo machines which mechanically delivers rapid and multiple needle punctures as it glides over the skin. 0.3mm may be used at home. The needles puncture the surface, barrier layer of the skin to enhance penetration of therapeutic serums and stimulate cell turnover. Over time, real improvement of skin quality can be achieved with home devices. 0.5mm-1mm may be used by qualified beauty therapists and there is good evidence to suggest good results may be achieved with these needle lengths. 1.5mm needles will cause some pinpoint bleeding. Sterility and good infection control practise is essential. Also additional pain management, so these needle lengths should only be used by medically trained or supervised practitioners. 2mm needles are used to remodel scars and for thicker skinned areas such as the back, thighs and buttocks. Best results are achieved when prescribed skin care is used to support the skin healing process. Caution: A multitude of devices are available to purchase on the internet. If they are cheap then they are likely to be poor quality and there is an increased risk of skin damage and infection, particularly when the needles are longer than 1mm. Results are achieved gradually over a period of months and three or more treatment sessions will be required to achieve optimum results. 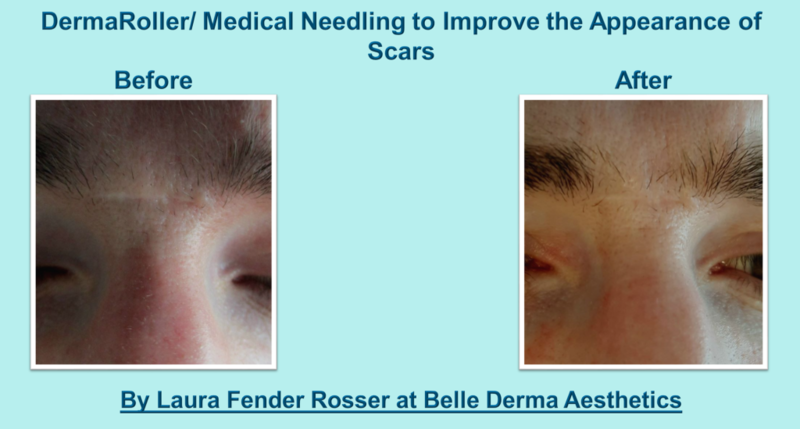 Results on scars are permanent, but for aging skin, maintenance treatments, one every 6 months are recommended. What is Used to Treat & What Results Can I Expect? There will be some redness; this will vary from one individual to another, from a light blush pink through to deep pink, such as sun burn. This will settle, usually significantly within hours, but sometimes taking two or three days to return to normal. The skin may feel tight and stingy for the first few hours. You are advised to avoid extremes of heat and cold and vigorous exercise for the first 12 hours. Over the first 5-7 days, the skin may feel tight and dry. Sunscreen must be applied daily. You will be advised to use post procedure products to minimise any redness and support the skin during the process. Results are achieved gradually over a period of months and three or more treatment sessions will be required to achieve optimum results. Results on scars are permanent, but for aging skin, maintenance treatments, one every 6 months are recommended. With any injectable treatment; Treatment is not recommended if you are suffering from any skin infection in or near the treatment area or are unwell in any way (even a cold). If you have previously experienced allergic reactions to any local anaesthetic. If you are taking any medicines which affect bleeding, such as aspirin or warfarin. If you are taking steroids or have autoimmune disease. If you have any bleeding disorders. If you suffer from a poorly controlled medical condition. If you are pregnant or breastfeeding. Caution Injections on the face can trigger the cold sore virus. If you are a sufferer, you must advise your clinician in advance of treatment. Some over the counter medicines and supplements can also affect bleeding (make you more prone to bruising) as can alcohol which should be avoided the day before and after treatment. Vigorous exercise, sun exposure, sun beds, sauna should be avoided for 48 hours, or as advised by your clinician, after treatment. Safety has not been established for those skins susceptible to keloid scarring. When the needles are longer than 0.5mm, local anaesthetic cream is necessary to numb the skin prior to treatment. Those receiving treatment will still describe the experience as uncomfortable, if not painful. The new ‘derma-pens’ deliver virtually painless treatment due to the vibration and high speed of penetration. All treatments carry a degree of risk. However, this is a very safe treatment, complications are rare when the right tool is used in safe hands, and the aftercare advice is followed. All risks and complications will be discussed with you at consultation and prior to any treatment being agreed. Your practitioner will take a detailed medical history and an assessment of your needs and expectations to ensure this is an appropriate treatment for you.